Wiz Khalifa and Amber Rose have a playful back-and-forth on social media. While the two have been split up for a few years now, Amber Rose and Wiz Khalifa have shown to be model co-parents, leaving any issues they may have behind and raising their son Bash together. The former couple recently spent time at their son's birthday party, dressing up as superheroes for the affair and showing their pearly whites for the cameras. The two apparently still like to have some fun with each other as well, having a playful back-and-forth on Instagram earlier today. 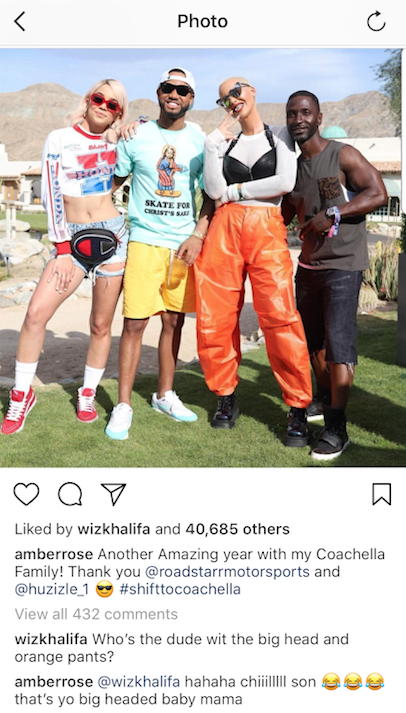 Posting a photo of her crew at Coachella over the weekend, Amber Rose was likely not suspecting to get clowned in the comments sections by her ex-husband Wiz Khalifa, but it happened nevertheless. Making his presence known, Wiz jokingly roasted the mother of his child, writing, "Who's the dude wit the big head and orange pants?" Of course, Amber's bald head garners jokes on a daily basis but she has been rocking the look confidently for years. Swiftly responding with plenty of laughing emojis, Amber made fun of herself, saying, "@wizkhalifa hahaha chiiiilllll son. That's yo big headed baby mama." Nothing wrong with a little banter between the former couple every once in a while. Wiz and Amber were married for approximately three years between 2013 and 2016. Although the pair has each gone their separate ways with Amber previously linked to 21 Savage, the two try their hardest to raise Bash cohesively, and jokes like these appear to be all in good fun. Kendrick Lamar Wins Pulitzer Prize For Music With "DAMN."